If you follow me anywhere on social media you are probably well aware of my coffee obsession. If Starbucks had a ‘Platinum Member’ status, I would qualify. I drink so much coffee, I have not one, but TWO recent projects that involve my multitude of leftover K-cups. Because of this (probably unhealthy) obsession with coffee, last year the fine people at Keurig sent me a Keurig2.0 to play with and test out. The big “claim to fame’ of the 2.0 is that it not only brews single serving K-Cups, but it also brews full pots of coffee. That is the “2.0” part of this machine. But this post isn’t really a review of the 2.0. I don’t love it enough to plug it here. This is more of a ‘hack’ to get around one of the biggest drawbacks this new version has. Because I already have a plethora of coffee brewing machines, I’m pretty picky about coffee brewers. 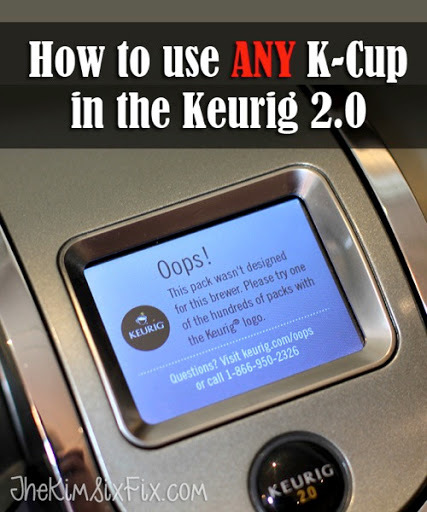 So when I learned that the 2.0 ONLY ACCEPTS KERUIG 2.0 K-CUPS I was annoyed. All my previous Keurigs accepted ANY K-cup style pod. Even non-Keurig brand cups and the refillable K-Cup (which cuts down on all the plastic waste.) I always loved to buy those huge variety packs of different flavors and types, but this new machine wouldn't accept them. I also had become slightly obsessed with these Gevalia Lattes and Cappuccinos and when I realized the new Keurig wouldn’t take them, I was not a happy camper. and it didn’t work! It gave me the error message on the 2.0. I was peeved. Here I had spent almost $20 on a box of useless K-Cups! All the information I had read about the 2.0 said that any cups with that white outer ring would work. But in this case, even THAT wasn’t true. It was getting to be a total crap shoot. So that was that! I was determined to FORCE the machine to accept any K-Cup! I knew the way the machine worked was a sensor detecting the outer ring on the lid of the K-Cups, so I found a K-Cup that I knew worked and I removed the lid. And VOILA! It is ready to brew my Seattle’s Best KCup! Now I just keep that extra foil lid on top of my machine and anytime I get the error message, I just put it over the top of the “bad” KCup and brew away! Please keep in mind that this is NOT a Keurig approved way of using your Keurig 2.0 and doing this will probably void the warranty and has the potential to damage your machine. I am not responsible for any damage resulting from following this tutorial.